Plastic is a problem we all should feel responsible for. At Designer Plants, we are not some ordinary artificial greenery supplier. We care about the impact we have on the environment. Our vertical garden and green wall range is made from earth-friendly materials. That’s no harmful chemicals or toxins, ROHS compliant materials – safe for your home, pets and guests. But what a lot of people may not realise is that we also understand that plastic isn’t usually great for the environment. In fact, the biggest pollutant in our oceans as a category is plastic. We don’t think that is something to be proud of. That’s why our vertical gardens are 100% recyclable. We use sustainable materials, which means you can recycle your green wall if you ever decide to part with it. We are the first artificial greenery company in the world to have 100% recyclable green walls and an artificial green wall recycling program. Given we also use high quality material and manufacturing processes, you won’t need to dispose of your green wall anytime soon. But if we don’t plan for the future, no matter how far that may be, who will? We want to ensure that our green walls are recycled. So if you need to part ways or your wall has reached its lifetime use, you can recycle your artificial green wall or garden to our head office showroom. You can do this in-person in Moorabbin, Victoria or send it to us via the post. You only need to pay the postage for your recycled plastic. We take care of the recycling for you. Ensuring that your 100% recyclable artificial green wall goes to a good home or is used to create other goods. Because no one should have to enjoy a great view, without taking extra care of our planet. Do I receive a refund for a green wall I recycle? Our 100% recyclable artificial green walls don’t include a refund. However, any costs to recycle the walls are covered by us. So you won’t need to take time out of your day to visit a recycling plant in your local area. We would be happy to offer 10% off on your next order of new, updated green wall designs when you are ready. Can I recycle my green wall in my recycling bin? Although our green walls are 100% recyclable, your local area may have different requirements for recycling the green wall. This can differ by each council and their recycling processes. That’s why to ensure your wall is recycled properly, we recommend you drop it off to us or send it via the post. Are your other greenery items 100% recyclable? Some of our other artificial greenery is recyclable, but not the whole contents. For example, some of our artificial pot plants use concrete, which is not welcomed for recycling. If you are not sure, you can contact our friendly team and we can assist you with this. We are always exploring more ways to help produce sustainable goods in our business, whilst meeting our customers demands for sturdy and high quality artificial greenery. 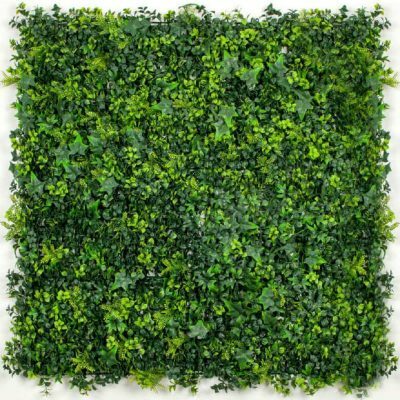 What materials do your plastic artificial green walls use? Our green walls are made of a high-grade PE soft plastic. Our premium fire resistant green walls, also come with a metal backing which can be recycled also. How often do people recycle artificial greenery? This can vary based on need. However, it’s not rare for customers to want to recycle after having their walls for 10-20 years. More often than not, customers are likely to recycle only because they have moved homes or are looking to change their space again. We have designed our green wall and vertical gardens to last. Our range is backed by a 5 year fade and crack guarantee because we are confident about this. We also independently test our range to ensure it meets the highest standards of quality. Our independent testing shows 8 years of UV resistance and has seen many examples of where our walls are still going strong beyond this timeframe. 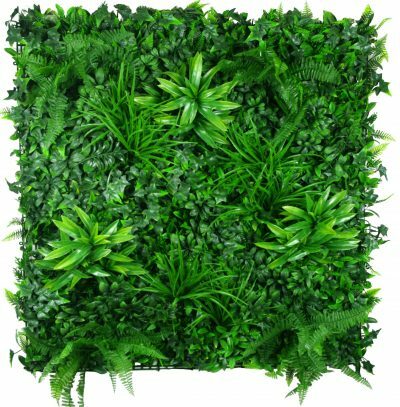 Can I recycle artificial green walls from another company? No. Not all green walls are made with the same sustainable materials. Our team is trained to identify the wall materials when you visit us. If we advise that the item is not recyclable, we will be unable to hold or capture that item for you as part of this recycling program. If you send us an item in the post that’s not a 100% recyclable green wall or item, we may return it back to you; or arrange for its disposal. Wouldn’t it be better to promote real plants over plastic? We were in the business of real plants before going artificial and know how you feel. We encourage our customers to explore both real and artificial alternatives where it suits them. The reality is not everyone has the pleasure, time or ability to enjoy a green thumb or well cared for green wall. Some people also have allergies to pollen and common bacteria found in soil (for example hospitals prefer not to have soil inside, but still want to offer an aesthetically pleasing green wall). A vertical garden can also add more environmental costs in other ways. For example, increased water usage, fertiliser (a major issue, particularly when synthetic fertilisers are used), continual green waste and collections contributing to emissions or even fires.